The classic layout of a medieval village. The long groove running left to right formed the main route through the settlement. The large rectangles either side are called crofts and they represent gardens used for growing vegetables. Within these are smaller rectangular earthworks, called tofts, which were walled plots with a house and perhaps a barn standing within. 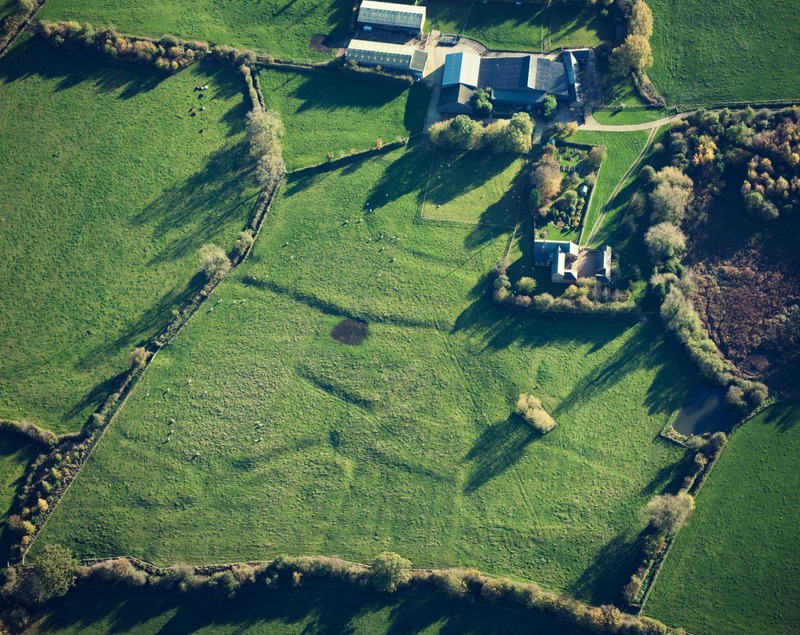 The large rectangle in the centre may have been the manor house or chapel. Surrounding this deserted village are the undulating lines of medieval ploughing, known as ridge and furrow. Although Clipston is still occupied, many abandoned features surround the current village. 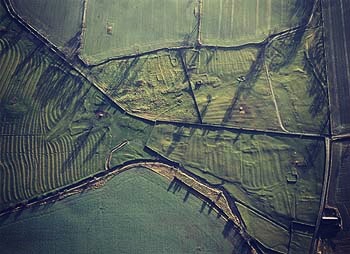 This image shows crofts, tofts and extensive medieval ploughing. The most famous and one of the best preserved British deserted medieval villages, Wharram Percy is a nationally important scheduled ancient monument. Visiting details. 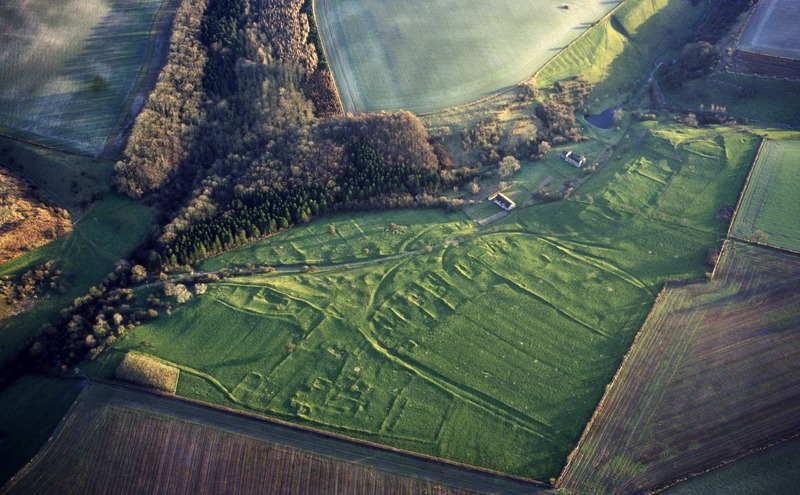 Crofts, tofts and a buried fish pond are the only remains of this lost medieval village. 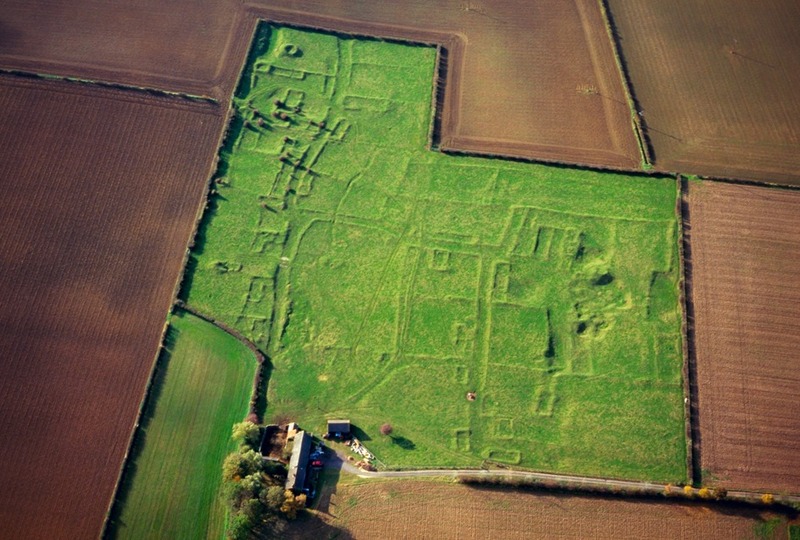 A complex of grassy humps and bumps clearly show domestic buildings, trackways, dovecotes and a fishpond. Legend has it that the village was demolished because it was a den of thieves, but the real reason for its abandonment remains uncertain. Visiting details. 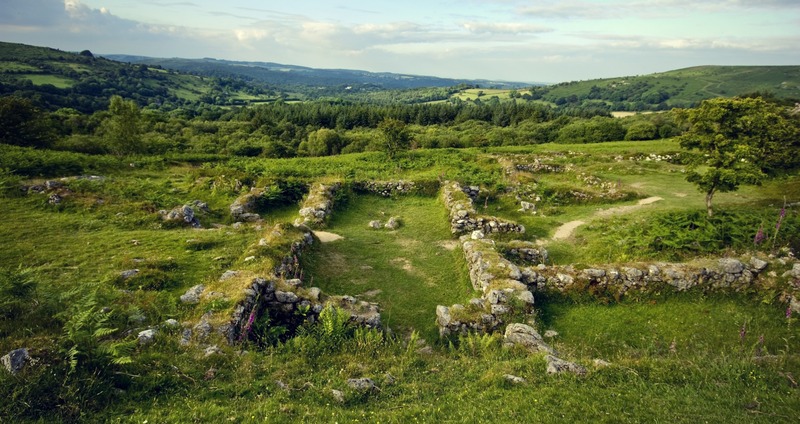 Four 13th century stone farmsteads are the only remains of this isolated Dartmoor hamlet, on land first farmed in the Bronze Age. Visiting details. Lost, deserted and shrunken medieval villages scattered across the country can still be seen today. 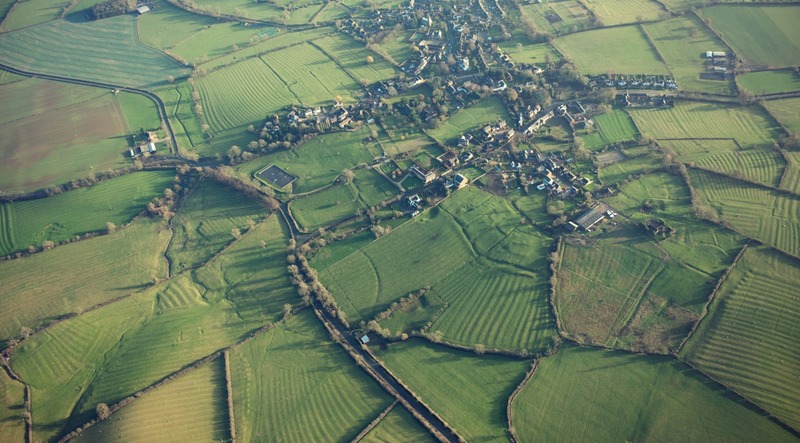 Villages were the most distinctive aspect of medieval life and the archaeological earthworks which remain help us experience the spaces in which medieval people farmed and made their homes in the English landscape, telling us much about their everyday lives. Most of these villages were deserted or shrank in the 14th and 15th centuries, often because of a shift from arable farming to sheep rearing which needed a smaller labour force. I love these photos from a time lost. If pictures can paint a thousand words, these photos just ask me one: Why? Thank you for posting this history lesson, we need to be reminded of where we came from and how we got here. Some great glimpses of everyday life showing up in those photographs – particularly Gainsthorpe, and Wharram Percy. I’ve visited Faxton, also a deserted medieval village, and also in Northamptonshire, and it was surprising at just how many clues were left there for the eye to see. What made Northamptonshire villages so desirable to leave? Interesting that someone has heard of Faxton, my father was born there in 1925 before moving to Brixworth as a child. Wow, amazing photos and fascinating history! 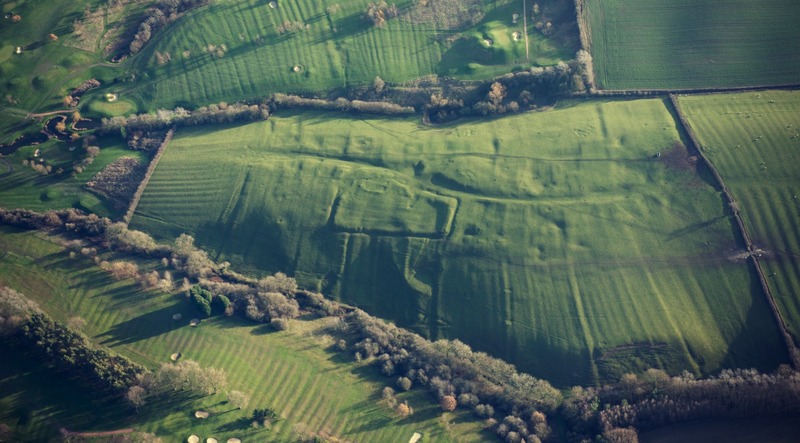 I love features on aerial archaeology. Thanks Jo. Have you seen our Britain from Above posts? If anyone has any further information or enlightenment on these abandoned villages or know about the ordinary peaple who lived and worked there I would welcome hearing from you. In the early 13 hundreds there was a famine and the black death arrived. This ment up to 50% of the population died. The upside of this was that if you survived your services were now in demand and many villages were left empty as workers left for better wages. The villages were then levelled for grazing as this was less labour intensive. Wonderful photos! Can anyone comment on whether recently tilled fields hide additional parts of these villages and if more recent landholders have consciously preserved these remains or left them unbothered by chance?